I intend to introduce this essay in the same way Tanya Luhrmann (2012) introduces her book; with perhaps some of the most intriguing and pertinent questions that challenge both the modern day understanding of religion, and indeed, the anthropologists who study it. How are rational, sensible people able to sustain belief in an endlessly powerful, yet completely invisible God, in an environment of overwhelming scepticism? And, how does this God become real for these people? Luhrmann sought to answer these questions through long-term ethnographic fieldwork amongst evangelical Christians, more specifically, congregants of the Vineyard churches across America. 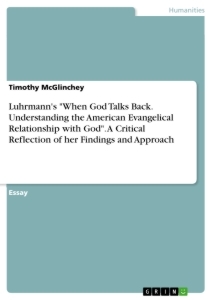 In this essay I will seek to summarise and critically engage with the theories Luhrmann developed, the findings she made, and importantly, the approaches she used in the formation of her book: When God Talks Back. In doing so, I hope to shed more light onto the field of the anthropology of religion by exploring the broader applications of her work. For more than two years, Luhrmann immersed herself in the life of the churches she attended, and in many ways, became as much a member as any other. She went to countless Sunday morning services, was part of Bible study groups, involved herself in any practices or events held by the church, and even saw a spiritual director. This being said, she was far from passively participating. During the course of her fieldwork she interviewed dozens of Vineyard congregants, recorded services and Bible studies, and had church members take part in her own qualitative and quantitative questionnaires and tests. Fundamentally, she was seeking to understand the intricate elements, purposes and effects of faith and faith practices, and did so from her own perspective as a cognitive anthropologist. My conclusion to Luhrmann’s findings is that the persistence of Christianity, in the face of scepticism, is explained by the personal reality of God that congregants come to experience through constructing what she has defined as a “participatory theory of mind” (2012:40). In brief, this refers to the method of perceiving, and discerning between, the external world and one’s internal thoughts and feelings, in a way that allows one to experience God whilst working around the barriers imposed by modern day scepticism. In this essay I will focus on explaining this theory and providing examples of the experiences it provokes, whilst also exploring some of the practices involved in attaining this new theory of mind. Throughout, I will analyse the benefits and drawbacks of the approaches adopted by Luhrmann, namely cognitive and functionalist, questioning their effectiveness in contributing to the field of the anthropology of religion. When first introducing the “theory of mind”, Luhrmann suggests that it is a cognitive mechanism everyone uses as a means of separating and discerning between what happens externally in the physical world around us, and what happens within the privacy of our minds. However, Luhrmann’s claim is that the faith of the charismatic Christians of the Vineyard church requires a new theory of mind. This theory must accommodate for a God who is not only intimately familiar with one’s inner, private world, but can even interact with it. She suggests that this framework is established through the Christian practices and teachings of churches as well as the intentional efforts of the individual. This sentiment is clearly explained when she posits, “The task of becoming a Christian… demands that one set out deliberately to overcome this fundamental human awareness that our minds are private” (2012:40). She specifically defines this achievement as the “participatory theory of mind” (ibid), as it insists on the barriers between mind and world being “porous” (ibid) and accepting of God. This, therefore, leads to a new process of interpreting internal processes, and external events, which actively involves and incorporates God. Luhrmann’s cognitive approach is clearly active here in that she seeks to explain how culturally produced practices can deeply influence the psychological dynamics linked to religious adherence. This notion is clearly reflected by the influential cognitive anthropologist D’Andrade, in discussing the effectiveness of this approach; “Another major accomplishment [of the cognitive approach] has been to provide a bridge between culture and the functioning of the psyche” (1995:252). In assuming Luhrmann is correct, that a new theory of mind is indeed developed through the practices that some Christians attend to, then it appears to surface in a variety of different ways. Although it is crucial to investigate how such a mind-set is formed, perhaps it is more important to first understand how it manifests itself for these Christians, as these experiences are crucially interwoven throughout the major focuses within the book. Despite there being numerous unique examples of such experiences, in general I see them as falling within several key categories of subjective interpretation; internal processes such as thoughts and feelings; external events; and “sensory overrides” (2012:216). To explain the case of internal processes, I will use the example provided by Luhrmann of Elaine, a Vineyard congregant. We are told that Elaine, at one point, decided to become a missionary in Africa because she had a “vivid dream about being on an African safari” (2012:275). A dream appears to be a common medium through which Christians interpret God as speaking to them. The new theory of mind, as Luhrmann would argue, comes into play here as it allowed Elaine to experience the dream, not just as a dream about Africa, but as a message or even direction from God that she should be doing missionary work there. In the case of interpreting external events, Elaine’s case is once again applicable. The book is rich with testimonies and examples of when God has revealed things to people through very real occurrences such as conversations, sights and “coincidences”. In Elaine’s case, very soon after she had her dream, she was in a Sunday service and found herself talking with someone she did not previously know, Ann, with whom she felt a “deep connection” (ibid). That person gave Elaine a pamphlet relating to ministry which she realised she had dreamt about, “that very booklet, with that cover” (2012:276). In this case, Elaine’s new theory of mind led her to interpret this external incident, not as a friendly yet insignificant encounter, but as God solidifying her existing belief that He was directing her towards ministry and mission. The term “sensory overrides” is one that is generously scattered throughout Luhrmann’s research and refers to fairly rare experiences where one’s senses are hindered, almost tricked, in an involuntary way and are believed, by the subject, to be real as opposed to mis-remembered; as she explains, “They are experienced as the sensory perception of something external” (2012:216). David, another Vineyard congregant, is a prime example for the occurrence of sensory overrides. He said that sometimes he would see things as real in the world in front of him, and that he has even felt God touch him. The apparent reality of such events for people, like David, who experience them, does seem to support the validity of a cognitive approach to understanding experiences of the divine, resulting in what feel like very real encounters. Moreover, having dissected some of the most relevant manifestations of the proposed “participatory theory of mind”, it is now important to critically engage with the claims Luhrmann makes and analyse whether the cognitive approach she used is truly helpful in contributing to our general understanding of religion. In my opinion, the theory is effective at explaining one, albeit key, element of religious experience, whilst ignoring another. It provides a very strong explanation for why Christians who believe in God and wish to experience Him can come to do so, but to a large extent ignores the multiple accounts of non-Christians who have had very similar “religious” experiences (that have led to a change in belief) but who have had neither the desire, nor the spiritual direction to construct this new theory of mind.